Bangalore was happy to host the second annual conference of Indian Society for Transfusion Medicine from September 13-15 2013. The conference brought together the experts in the field of transfusion medicine from across the nation. It was a great opportunity to learn and share. The conference was packed with engaging scientific talks, paper presentations and debates. The program was very well received by the participants and ended up as a grand success. As part of the recent innovations in India in the field of blood transfusion medicine, the organising committee invited Sankalp India Foundation(SIF) to make a presentation. It was indeed our pleasure to have been given an opportunity to share our experience with Bombay blood group with such stellar audience. 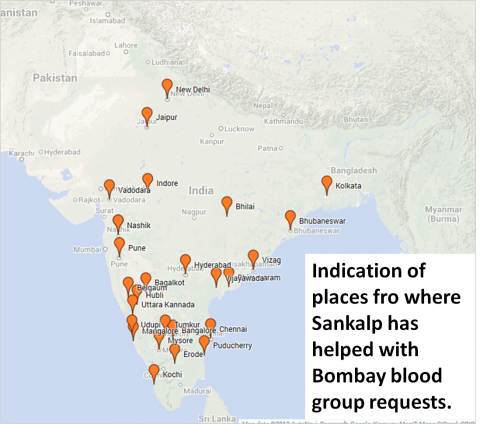 www.bombaybloodgroup.org is an initiative which has built a network of blood banks, donors, logistics and volunteers to ensure timely blood availability for people in need of extremely rare blood groups. The organisation has been managing complicated blood requests on a routine basis from all across the country. Ensuring blood supply for all patients has been an immense learning experience. SIF has learn to find solutions that work in-spite of the limited number of donors, the limitations of some blood banks and other administrative issues. With persistent attempts, it was observed that the participation of the smaller blood banks increased and the rare blood groups were better utilised. The time tested success of the strategies adopted in Karnataka have led SIF on its way to scale up the networking across the country. ISTM conference happened just in time for this massive effort. The audience received the presentation very well and was kind enough to warmly encourage the speaker and the initiative. Post the presentation there were some very fruitful discussions. Several blood bankers expressed satisfaction at the work being done and assured active participation from their blood banks. There were blood bankers who shared how they had to discard the units of extremely rare blood groups because of lack of local demand. They were confident that with nationwide networking such instances will come down. Some blood bankers also promised to make screening for Bombay blood group a routine in their blood banks. SIF volunteers speak to blood bankers across the nation during emergency situations. An added advantage of coming to the conference was to meet the same experts in person. The team interacted with several experts who had previously helped organised for blood in difficult situations. We are grateful to the organising committee of the conference and specially Dr Shivaram for inviting us to share our experience at the event. The experts in blood transfusion medicine from across the nation have expressed their support and assured their participation in the initiative. With this SIF is all set to bring in effective and fruitful networking between blood banks for optimised usage of extremely rare blood groups. 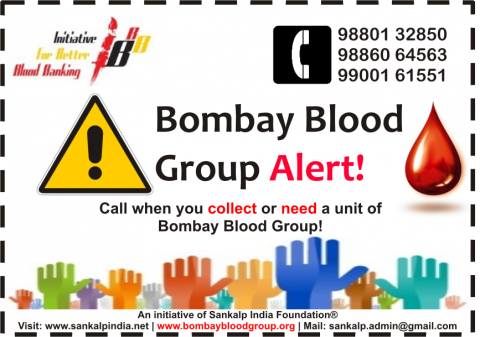 Any hospital/blood bank in the country to place a request for Bombay blood group(BBG). Within few minutes the best possible option to get the units is made available. The coming together of all individuals with BBG (whether they are blood donors or not) from across the nation on a single platform.